Bulk posters are an effective and affordable way to make a big announcement. Let more customers know about an upcoming sale, product launch, or store opening in their area. Bulk poster printing yields hundreds to thousands of pieces that people will notice. We offer several bulk poster sizes that fit most public spaces. 11" x 17" - The standard size for smaller posters promoting concerts, weekend markets, and other community events. 18" x 24" - The go-to size of photo prints and visual posters that promote a new product or are part of an advertising campaign. 24" x 36" - A popular size for large wholesale posters place outdoors or display for decoration. Custom sizes - Can’t find your poster size in our choices? Send us your preferred dimensions and you’ll receive a custom quote based on your specifications. Note: Shrink wrapping is also available for our smallest sizes: 8.5” x 11”, 11” x 17”, and 12” x 18”. A thin, transparent plastic wraps around bundles of 100 for easy counting and protection during shipment. We offer two lightweight paper and three durable cardstock materials. You can choose from different coatings that distinguish the poster designs. Best seen in outdoor areas or visible from a window display. Order 500 to more than 1,000 pieces to utilize our wholesale poster printing services. Hundreds to 5-figure quantity orders can be ready on the same day or by the next business day. Upload your ready file online or download one of our templates to start bulk poster printing today. All orders are ready for shipping once you have approved the print-ready file. Is there a minimum order for wholesale poster printing? 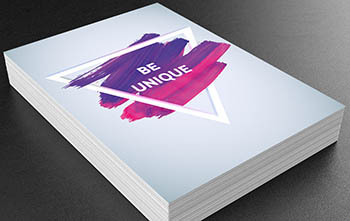 You can order as little as 100 posters for your bulk printing needs. Most customers opt for about 500 to 1,000 pieces. Which coating offers the highest shine & visibility from a distance? The material and coating work hand in hand to showcase your poster design. High gloss UV gives extra shine, vibrancy, and contrast. All materials except for the 80 lb. paper come with high gloss UV printing on one side. Do you have writable surfaces available? Our uncoated option is writable and can be applied on both sides for the 14 pt. Cardstock. We recommend printing one side as high gloss UV and the other as uncoated for maximum protection. When can I expect my bulk poster order? All orders with quantities at or below 25,000 can have the posters ready today or on the next business day. Note that the printing turnaround you select refers to how long it takes to produce your order. Shipping time is not included in the turnaround time and begins. To find out when your order will arrive, select Get Delivery Estimate on our online calculator & input your ZIP code. Bulk Posters is rated 4.9 out of 5 by 39. Rated 5 out of 5 by Timothy from Excellent service, great printing! I ordered 3000 posters. The printing cost was great and being able to pick them up in North Jersey was very convenient in my travels. Thanks! Rated 5 out of 5 by dramamama from Beauty and the Beast Posters I have ordered postcards and posters from Next Day Flyers several times and I have always been very pleased with the quality of the product and the friendliness of the staff.